TRPTriCOX Soft Chews (120 chews) are a complete joint support supplement for dogs. Tricox features a unique blend of ingredients, including UCII, astraxanthin, glucosamine, MSM and creatine. These soft chews are highly palatable, using TRP technology and an irresistible liver flavor. Recent findings have shown that the primary occurrence and progression of osteoarthritis in dogs is an abnormal response of the immune system to exposed cartilage proteins. TriCOX helps combat this by desensitizing the immune system and preventing proinflammatory immune attacks on joints through a patented form of undentured collagen called UCII. In recent scientifically objective GFP and clinical studies, UCII was shown to: Decrease lameness by 78 Decrease overall pain by 62 Decrease painful limb movement by 91 Increase peak force by 18 Increase impulse area by 44 Boswellia extract further assists in maintaining normal inflammatory response. TriCOX also contains Astaxanthin, which is a powerful antioxidant that has been proven to be 6,000 times more potent than vitamin C. TriCOX's comprehensive joint support includes the cartilage building blocks glucosamine and MSM, and muscle support with creatine. 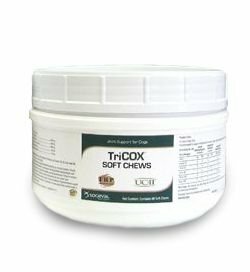 TriCOX is formulated using the TRP Soft Chew technology, giving the product unparalleled softness and palatability. TriCOX is highly recommended for elderly dogs, active and working dogs, dogs with joint stiffness and discomfort, or dogs that may have difficulty rising, jumping or taking stairs. TriCOX Soft Chews are a complete joint support supplement for dogs. Tricox features a unique blend of ingredients, including UCII, astraxanthin, glucosamine, MSM and creatine. These soft chews are highly palatable, using TRP technology and an irresistible liver flavor. Recent findings have shown that the primary occurrence and progression of osteoarthritis in dogs is an abnormal response of the immune system to exposed cartilage proteins. TriCOX helps combat this by desensitizing the immune system and preventing proinflammatory immune attacks on joints through a patented form of undentured collagen called UCII. In recent scientifically objective GFP and clinical studies, UCII was shown to: Decrease lameness by 78 Decrease overall pain by 62 Decrease painful limb movement by 91 Increase peak force by 18 Increase impulse area by 44 Boswellia extract further assists in maintaining normal inflammatory response. TriCOX also contains Astaxanthin, which is a powerful antioxidant that has been proven to be 6,000 times more potent than vitamin C. TriCOX's comprehensive joint support includes the cartilage building blocks glucosamine and MSM, and muscle support with creatine. 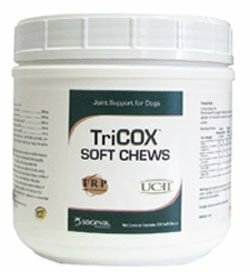 TriCOX is formulated using the TRP Soft Chew technology, giving the product unparalleled softness and palatability. TriCOX is highly recommended for elderly dogs, active and working dogs, dogs with joint stiffness and discomfort, or dogs that may have difficulty rising, jumping or taking stairs.